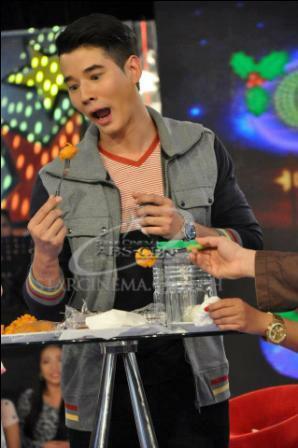 Thai heartthrob Mario Maurer didn't resist to eat Pinoy street foods during his guesting in the Sunday's comedy live show "Gandang Gabi Vice." The show's host Vice Ganda taught him to eat the everybody's favorite Pinoy street foods namely "kwek kwek" (quail's egg) and "betamax" (chicken's blood). The recent episode of "GGV" also became the top trending topic in the microblogging site Twitter not only in the Philippines but worldwide! Mario together with his "Suddenly It's Magic" co-stars namely Kakai Bautista, Joross Gamboa, and Erich Gonzales showed their funny sides with Vice Ganda!